A recent news article has brought some pretty weird and wacky flower care tips to our attention so we thought we'd examine these in a bit more detail. 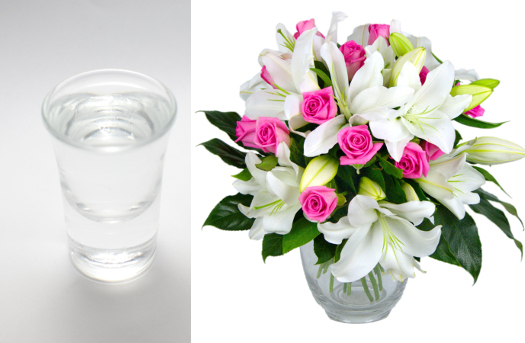 Amongst the unorthodox advice is one interesting hack to keep your bouquets fresh for longer; give them vodka. This strategy has been known to work for humans I suppose, so why not flowers? It turns out there is actually some scientific grounding behind what seems, at first glance, a somewhat absurd idea. As alcohol is an antibacterial agent, a teaspoon of vodka mixed in with a litre of water makes for a rejuvenating drink for your flowers. As well as helping to kill off bacteria on the stems, there is some evidence to suggest that alcohol inhibits the production of athylene which is a gas produced by plants which causes them to mature. So there you have it. Next time you reach for the liquor cabinet with a thirst that only a Bloody Mary can quell, spare a thought for your flowers as they may be thirsty too! Other unusual flower maintenance hacks are also proposed. For example, a capful of mouthwash in a litre of water is also thought to provide anti-bacterial properties to keep your bouquet looking beautiful. Or you could add a copper coin to the bottom of the vase, although it is thought that the fact that UK pennies are made using copper plated steel nowadays as opposed to bronze makes this particular approach less effective. Other methods that were tested with varying levels of success included lemonade, bleach, and aspirin. Do you have your own special secret to keeping your flowers fresh and healthy for longer? We'd love to hear about it if you do.